While reaching an outstanding complexity in the improvement of the human portrait, while exploring the perfection of the human body’s proportions and symmetries, Leonardo da Vinci sketches several experiments in deformation and exaggeration of the human figure. 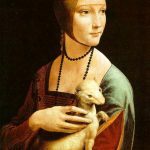 Leonardo Da Vinci, Lady With an Ermine, 1489-1490, Cracow, Czartoryski Museum. Source: Wikimedia Commons, public domain. 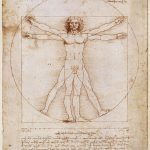 Leonardo da Vinci, Vitruvian Man, Venice, Galleria dell’Accademia, Gabinetto dei disegni e delle stampe. Source: Wikimedia Commons, public domain. 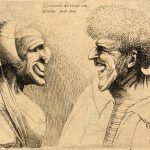 Wenceslaus Hollar, Two Deformed Heads after Leonardo,1645. Source: Wikimedia Commons, public domain. Scholars refer to Leonardo’s deformations as proto-caricatures, because of their lack of explicit satirical aims. Indeed, Leonardo’s misshapen figures are entangled with his more general inquiry on the human subject, on the inherent shape, both physical and psychological, of the human individual. In this perspective, the caricature can be considered as the exploration of divergent possibilities of representation of humanness, and also a form of criticism against the canonization of the Renaissance portrait, that adopted idealized models screening off the observation of reality. At the beginning of the 17th century, the painter and engraver Antonio Tempesta realised a series of six caricatures inspired by the characters of Ludovico Ariosto’s Orlando furioso. 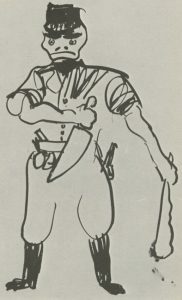 Tempesta reveals the comic potential of Ariosto’s work by applying deformation not to the figures that Ariosto had already represented as comical, but to the characters which in the poem are examples of perfection and beauty. The visual interpretation both translates and extends the humoristic imagination entailed in Ariosto’s work. 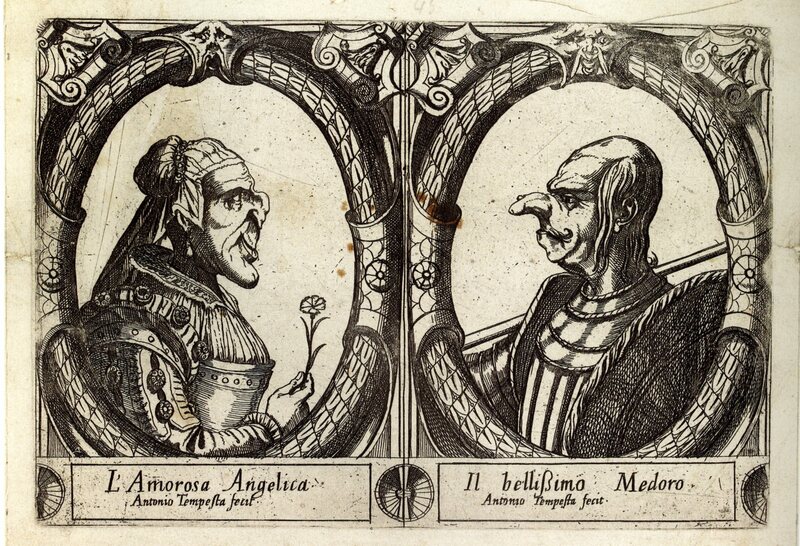 A. Tempesta, L’amorosa Angelica e Il bellissimo Medoro, 16th/17th Century. Source: Wikimedia Commons, public domain.